In keeping with our philosophy of working smarter not harder, FIELDFIX Event Management makes reporting unplanned events in the field quick and simple. Using smartphones and tablets, field crew take photos, enter descriptions; make sketches, even sketch on photos, it really is that simple. FIELDFIX then merges all photographic and text evidence into professional customer reports in seconds, making light work of reporting in the field from anywhere, any time. When it comes to reporting an injury, FIELDFIX keeps your business up to date alerting management immediately of the situation. As soon as an injury is submitted from the field, FIELDFIX Event Management sends an automated “alert” to whoever is listed in the system as the key contact for the injured person, e.g. their manager or team leader. FIELDFIX files event reports to the relevant job keeping everything you need in one place. Our customers love this practical approach to business reporting. What’s more with FIELDFIX Custom Fields you can easily customise data captured in the field, so that it fits perfectly with your business reporting needs. There really is no limit to what you can achieve with FIELDFIX Event Management. Here at FIELDFIX, we believe in making real time business reporting quick and easy. We understand that there is nothing more frustrating than having quality data in a system that you just can’t access easily and that’s why our smart Job Management features make tracking the profitability of your jobs easy. FIELDFIX compiles all job related data into one easy-to-view screen so that you can stay on top of the bigger picture with easy to view graphs and pie charts. With improved graphs that show your percentage of profit in real time, FIELDFIX makes it easy to view your costs vs revenue per job, per contract or per client, and to see if a job is profitable at a glance. Now that’s smart! You can measure your productivity and see which clients aren’t rewarding your business for your work done, and whether a contract is really profitable for you or just costing your business money. With FIELDFIX, you can be rest assured about the health of your business from anywhere, any time. These improvements have been driven by customer requests. You asked for it, we’ve done it. Why field crew and business owners give FIELDFIX job management software the big thumbs up! As well as being practical for field crew, one of the other key benefits business owners and management alike value is the systems flexibility. In order to stay ahead of the game, businesses need to be able to adapt to change quickly. FIELDFIX job management offers complete flexibility to scale up or down to suit your business needs. Built to work in any business FIELDFIX caters for small companies with minimal users up to large international organisations where managing multiple contractors and complex jobs in real time is crucial. FIELDFIX ticks all the right boxes not just for field crew but for management too. “People who designed this system, don’t actually use it” – It’s surprisingly (and a little disconcerting) just how often you hear people around you saying this about their business software when they are struggling to get their daily job done and their “specifically designed” system just isn’t playing ball! At FIELDFIX we take a very different approach to software design because we strongly believe our customers shouldn’t have to put up with job management software that “more or less” does what they need it to. From the very beginnings FIELDFIX product development has focussed on the practical needs of field crew, with the people who use the system driving software development. 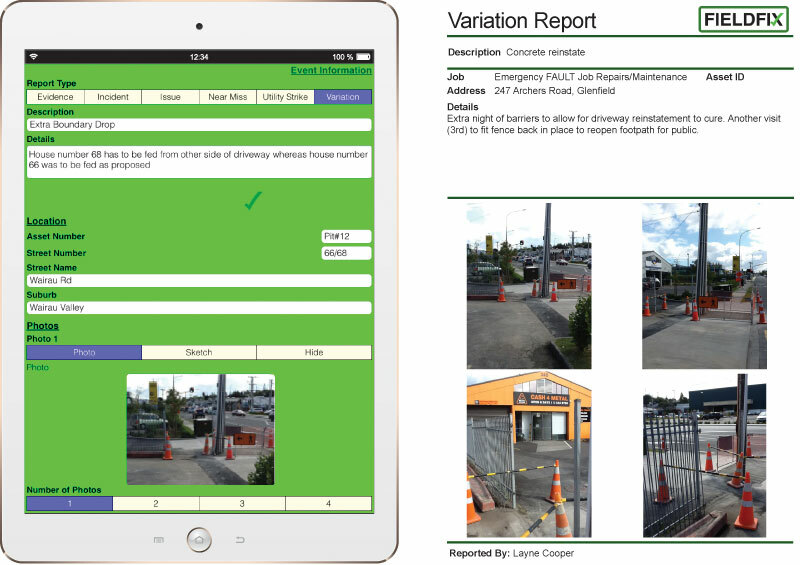 Even the green background of FIELDFIX job software field app was chosen for its practical benefit. After trialling it in action at the coalface the guys in the field gave GREEN the big thumbs up for being the most practical colour for visibility that worked in all weather conditions. When the hot sun was beating down on the devices, or the skies were on downpour mode, the green screen remained easy to view and allowed the guys to keep working smart in the field. The FIELDFIX team couldn’t agree more. With FIELDFIX mobile job management software, everything we do starts with the design. Get that right, and the rest will follow. And above all, listen to your customers’ needs because they are the ones who will be using your software! From its very beginnings FIELDFIX software was designed to work in any business. Built to offer mobile workforces from all kinds of industries the ability to not only capture but manage data from even the most remote places – the smart way. As a result of our flexible design approach, we are finding that FIELDFIX is appealing to all sizes as well as all sorts of businesses, near and far. In fact, once they learn what FIELDFIX has to offer and just how easy it is to get up and running and start working smarter not harder; new customers are quick to jump on board! Just this week we welcomed a new customer on board by the end of their first demo, all done remotely. But it’s not just our software that’s flexible in its design and set up. All too often we find software providers can over complicate the start-up process. At FIELDFIX we prefer the no-nonsense, practical approach to training and support and have put a lot of effort into making it as easy as possible to implement FIELDFIX. We also understand that downtime is money wasted so when it comes to getting started with FIELDFIX, we guarantee to have your office and field crew up and running and working productively in no time. What our customers want is a no-nonsense, practical approach to training that works for their team as well as their budget. Who can argue with that? It makes perfect sense to the FIELDFIX team! And once we’ve got you up and running our support doesn’t stop there. We positively encourage our customers old and new, to pick up the phone and talk to us, no matter how small the question may seem. After all, that’s what our support team is here for. FIELDFIX support – we’re not just about the software, we’ve got your back. When it comes to data security, Angus Kidman really sums it up nicely, don’t you think? At FIELDFIX we are just as passionate about keeping your information safe as we are about capturing it! “When the system your business depends on shuts down it can cause all kinds of problems and unnecessary stress, not to mention the actual cost of downtime. That’s why at FIELDFIX our hosted infrastructure includes best of breed servers, redundancy, data recovery and data security. So when it comes to choosing a software provider, don’t just think “does the software do what we need it to,” but also “can my business rely on this service provider ” because at the end of the day consistent reliability of IT services is crucial for any business. That’s why our customers are confident to leave IT to us. We take care of the “geeky” stuff, leaving you to get on with doing business. Just the way it should be. “People who designed this system, don’t actually use it” – Just the other day whilst in the bank I heard this very line and it got me thinking just how often you hear people around you saying this about their business software when they are struggling to get their daily job done and their “specifically designed” system just isn’t playing ball! In a recent article from CIO.com, Thor Olavsrud discussed the reasons why more and more businesses are turning over certain IT functions to managed service providers, allowing internal IT staff to focus their energies on strategic IT projects. With a collaborative working model and the focus being on “partners, not replacements” this practical approach certainly rings true with the FIELDFIX philosophy of “working smarter not harder” to get the job done. These days, many software platforms try to be all things to everybody and end up being the jack of all trades and the master of none. At FIELDFIX we take a very different view. Our philosophy is built around utilising the best solution for each business requirement rather than a “take over the world” approach. We like a practical, no-nonsense way of working and with over 20 years’ experience in the software industry, our customers know they can rely on us to deliver reliable job management software that does what they need it to do. Likewise, we enjoy working closely with our customers and always welcome their product innovation ideas, because we respect that our customers are the experts in their industry. Working collaboratively and recognising the benefits that this brings definitely gets the thumbs up from the FIELDFIX team every time. After all, with clear communication and understanding about what the service provider’s roles and responsibilities are, what’s not to like about sound collaboration and like-minded companies working together to get the best result for both the business and its people. Read more about us and the FIELDFIX way of doing business. When companies decide to change from existing paper processes they need to feel supported every step of the way. After all, you aren’t just changing paper processes when implementing new software, you are often changing how people work, introducing a new culture. Especially for the guys in the field who, unlike office staff, are often not experienced with using software to record and report on their daily activities at the coalface. FIELDFIX job management software is delivered as a service. From the get go, you can expect hands-on customer support throughout from initial deployment right through to helping you make the most of FIELDFIX for years to come. Furthermore, our thorough approach to implementation provides a low risk platform for managing the overall culture change required for mobile software implementation. FIELDFIX having come from the field understands this and has the toolsets and methodologies in place to assist organisations with getting to grips with this fundamental culture change within a business. Unlike many job apps, once you’re up and running our customer support doesn’t stop there. We understand that when you have a question, you need a quick response, and that automated “ticket” responses can not only be impersonal but very frustrating when you need an answer fast! That’s why when you call FIELDFIX support, you can be sure to get a reliable, personal response and we won’t keep you waiting. With over 20 year’s field service experience, we understand the practical needs of our customers. Rather than being a system designed in the office and pushed out to field crew to use, we started in the field and this gives us a unique perspective and understanding that many software companies cannot claim to have. Moreover, we know what works in the field through first-hand experience and we know what doesn’t work also. So remember, introducing new software may be a serious business but it doesn’t have to be a stressful one. With the right level of customer support and experience, it can be both an enlightening and fun journey too!